Trucker Tom Kenman of Joliet is hoping to get out of Northwest Indiana. He’s stuck because I-65 is closed. Kenman works for a contractor that delivers mail for the U.S. Postal Service. Northwest Indiana road conditions are improving but the area is far from normal and may be days away from recovering from an arctic blast of super cold temperatures. Motorists and truckers had to deal with closed roads and highways for much of Monday, and after briefly reopening, by 5 p.m., INDOT had once again closed I-65 due to hazardous road conditions; I 80/94 remains open. Earlier in the day trucker Tom Kenman of Joliet, IL passed the time in the cab of his semi truck listening to music and reading. Kenman works for a contractor that delivers mail for the U.S. Postal Service. He’s ready to return home after being stuck at a Speedway gas station near Interstate 65 and 61st Avenue in Merrillville. As of this morning, it didn’t look good for Kenman. “Things were kind of hazardous. About 6 p.m. (Sunday), things were hazardous so I jumped off on Route (U.S.) 30. I do maybe 20, 25 mph. That’s it. Even before they shut it down, I decided forget it. I-65 is a mess. I don’t know what I’m going to do. With most restaurants and businesses closed, even a nearby McDonald’s, Kenman waited it out slurping Speedway’s coffee and munching doughnuts. I-65 was closed to all traffic yesterday afternoon because of heavy snow and slippery conditions. Semi trucks were lined up along U.S. 30 in Merrillville, waiting for I-65 to reopen, along with nearby Interstate 80/94. 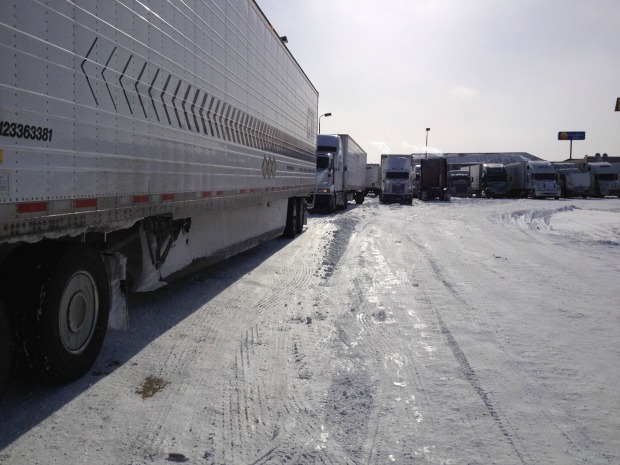 Kenman and other truckers finally got some good news in the afternoon, when the Indiana Department of Transportation reopened I-65 around 2 p.m.
“Drivers are advised to use extreme caution, take it slow, and travel at their own risk. Like the majority of roads across Northwest Indiana, and the state, conditions are extremely hazardous and non-emergency travel is strongly discouraged,” said INDOT spokesman Matt Deitchley. But the respite on I-65 was short-lived as officials would shut it down again only a few hours later. Earlier in the day, Deitchley told WBEZ that some drivers had been driving around protective barriers to keep them off of I-94. Drivers should expect to continue to encounter slick conditions and blowing and drifting snow both on the main line interstates and ramps. In fact, many motorists in Gary were struggling to drive along Broadway, the city’s main drag, with cars getting stuck in snowdrifts. Local officials had declared a state of emergency for Lake, Porter and LaPorte counties during Sunday’s heavy snow storm. Indiana Gov. Mike Pence ordered the Indiana National Guard to help stuck motorists along the highway. Much of the state is dealing with heavy snow and severe temperatures but Pence acknowledged at a news conference today in Indianapolis that Northwest Indiana may have been hit the hardest. That’s why the Republican governor was sending more resources to “da Region,” often divided from the rest of the state because of political and cultural differences. Early Monday, even with warnings by police to stay off the roads, some had no choice but to head to work. Hammond resident Gus Lopez said driving to his job at ArcelorMittal Steel in neighboring East Chicago felt odd. “It was really desolate out. Hardly anyone out driving,” Lopez told WBEZ. “It reminded me of my time in North Dakota, where this type of weather and this type of conditions is not unusual at all for folks up there, that far north. And this winter at least, "da Region" is starting to feel more like North Dakota than Northwestern Indiana. Most schools in Northwest Indiana will be closed Tuesday but government offices are expected to reopen. The Indiana General Assembly is also expected to open its session down in Indianapolis, a day later than originally scheduled. Follow WBEZ NWI Reporter Michael Puente on Twitter @MikePuenteNews.